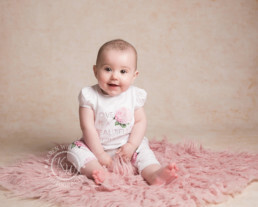 Here at KW Photography, I offer a variety of different newborn, baby and child photography sessions so this article is a round-up of the services that are available if you choose me as your family portrait photographer. I want you to be clear on what the options for child and baby portrait sessions with me are so that you can make the right choice for your family. 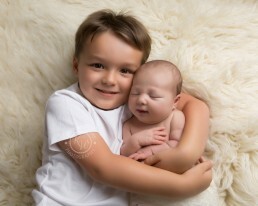 My most popular service is my newborn photography. This is my signature service – the one thing I have become known for and which I am the most experienced in. 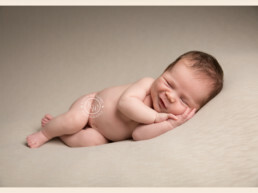 It’s completely true that photographing newborn babies is my first love! I just adore working with newborn babies and love creating portraits of your brand-new baby, capturing them as they are in their first few days of life. They don’t stay like this for long, so I think it’s so important to photograph this amazing stage. 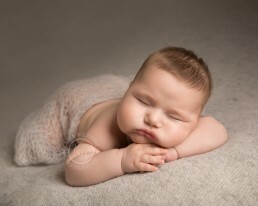 I’m known for my sleeping baby pictures and I’ve photographed over 700 babies to date! 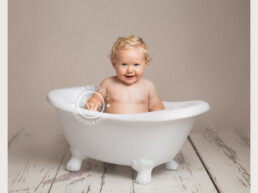 In this type of session, I spend up to 3-4 hours photographing your baby, creating a variety of poses, and using different props and backdrops to give you a wide choice of images (20-30) to choose from. Plus, if you want something different, in addition to the traditional posed newborn images, you can now take advantage of the option to have newborn photos taken in my outdoor garden studio as part your newborn studio session. This is included in the newborn session fee. Outdoor newborn portraits have proved very popular since I started doing them last year. I keep your baby warm at all times, don’t worry! As always, your baby’s safety is my number one priority. This is a great option for families who want newborn photos and know they’d also like to return for baby photoson two additional occasions in their baby’s first year. I typically capture babies at the ‘sitting’ stage, at approximately 6-8 months, and again on their first birthday (many families choose to upgrade this first birthday session to a ‘cake smash’ photoshoot). Another thing to point out is that when you book a newborn session with me, you are very welcome to bring older siblings, family members and even your furry friends to also be featured in the photos. I’m a dog lover myself and know that they are an important part of the family too! Adorable sibling photos and mum/dad pictured with the baby are important photos to take. Family photos (up to five people) come as standard too! 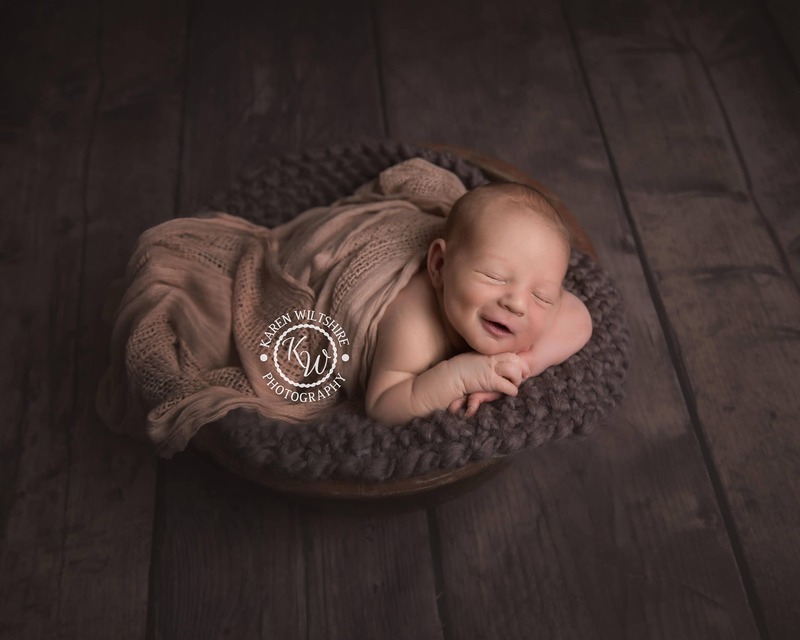 Click here for more information about my newborn photography services and here to see examples in my newborn photo gallery. Click here to watch a short video that shows you behind the scenes at a typical newborn photoshoot at KW Photography. Some photographers won’t attempt newborn-style photography with babies over four weeks, but I am very confident working with babies of any age. The images you can expect to receive when the baby is a little older will be just as beautiful, but they will be more relaxed as your baby won’t be as curled up anymore, and they will be more alert than days-old newborns who sleep almost all day. Which means that I can usually achieve adorable wide-eyed photos like this. Click here for more information about my newborn photo sessions and here to see examples in my newborn photo gallery. At approximately 6-8 months – typically babies are learning or have learnt to crawl and can sit independently which is a big achievement! And any time from 12 months old, babies start to walk. It’s lovely to capture those very first steps! And, if you wish to have more than one photoshoot during your baby’s first year, the ‘My First Year’ package, as I mentioned above, is a great value option. Find out more about the ‘My First Year’ package here. Cake smashes are hugely popular and it’s easy to see why! They are such fun for your baby and the photos are colourful and full of personality! 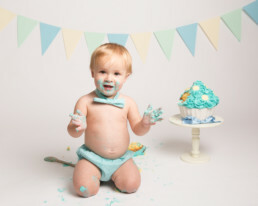 During a cake smash portrait session, your child gets the chance to celebrate their first birthday in style. With a giant birthday cake and sat in front of a colourful backdrop accessorised to your liking, they have the chance to play, eat and even destroy their cake while I take photos! But while cake smashes are traditionally associated with a baby turning one, they don’t have to be! Rules were made to be broken, right?! You can book a cake smash anytime from when your baby is sitting up independently, as I explain here. Click here for more information about my cake smash photoshoots and here to see examples in my cake smash photo gallery. Click here to watch a short video that shows you behind the scenes at a typical cake smash photoshoot at KW Photography. So, as you can tell, there are lots of different options available to you if you’re looking for newborn, baby and child photography. 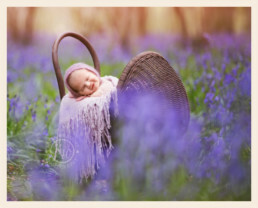 I’m proud to say that I am one of the longest-established newborn and baby photographers here in Dorset and that I’ve worked in this specialist genre of photography for seven years, photographing babies and children of all ages. An investment into professional newborn, baby or child photography is one that I guarantee you will never regret. The photos will keep the memories alive and you’ll treasure them forever. To enquire or to book a portrait session with me, please complete this contact form. I look forward to hearing from you!